An exquisite Tolkowsky 1/2ct diamond bridal ring set, featuring a platinum diamond solitaire engagement ring with a halo of diamonds and diamond encrusted shoulders, along with a diamond set wedding band. As the inventors of the Ideal Cut, Tolkowsky adheres to the highest standards of quality with diamond centre stones that achieve the best combination of fire, brilliance and sparkle within the diamond. 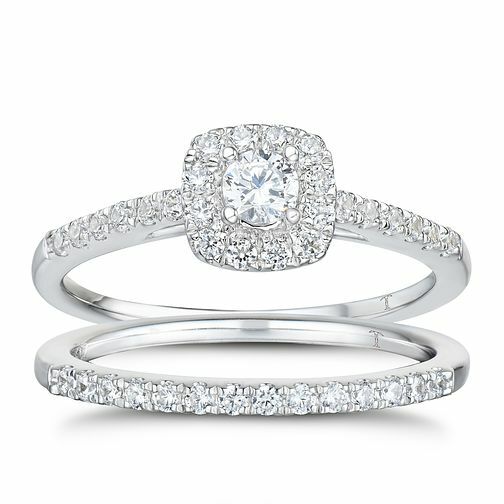 Tolkowsky platinum 1/2ct I-I1 diamond bridal set is rated 4.3 out of 5 by 4. Rated 5 out of 5 by Anonymous from Brilliant Ring Amazing ring and the service was brilliant, was given a lot of information on the designer of the ring and also if you buy from outlet you get 20% off!